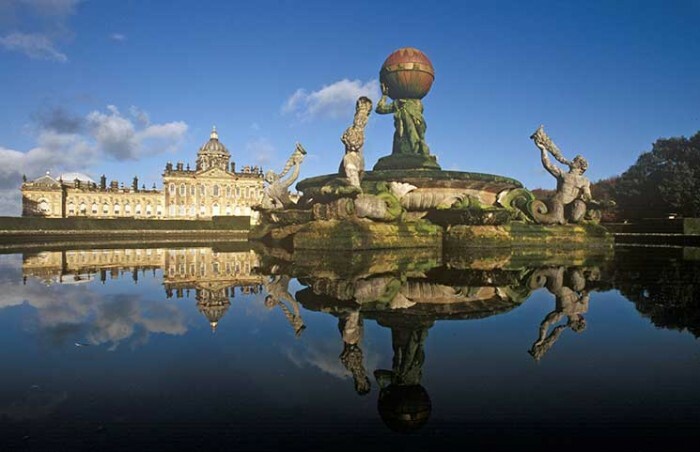 The first great work of the architect Sir John Vanbrugh in 1699 for Charles Howard, 3rd Earl of Carlisle, Castle Howard is arguably the finest Baroque stately home in Britain, with a spectacular Great Hall under the painted and gilded dome 80 feet high. Now that great dome looks set to shine again, as the lantern which sit atop it is being gilded with 23.5 carat gold leaf. Indeed, it is promised that, when complete, the dome will glisten in the sun to be seen from miles around. 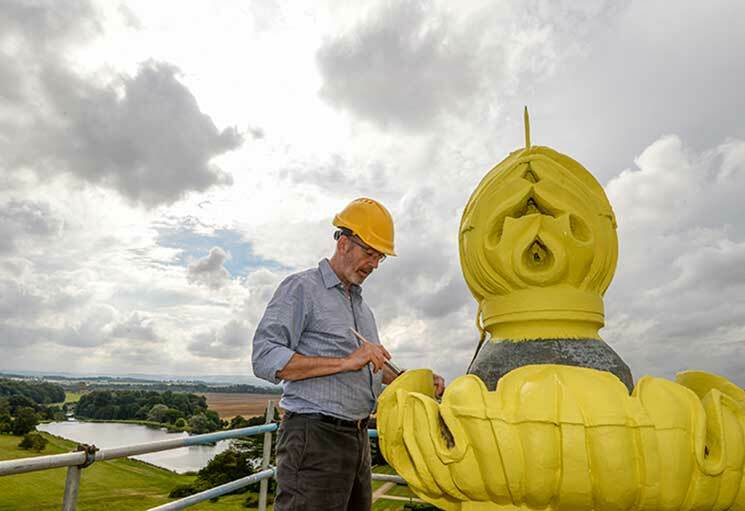 “The lantern is the crowning glory which sits on top of Castle Howard’s dome, and when finished, the highly-reflective gold leaf will be visible from miles around,” explains Nicholas Howard, who runs the estate and has commissioned the work. Visitors to Castle Howard over the last couple of weeks will have seen scaffolding covering the lantern – the decorative feature which sits on top of the dome – as the wooden finial, cornice and windows of the lantern were prepared for the work. “Approximately 1,000 sheets will be used, but the gold leaf is so thin that the entire weight of the gold used comes to a mere 16 grams. This would be roughly equivalent to the weight of a medium-sized bracelet; or if it was rolled into a ball it would be a similar size to a marble. The purity of the gold ensures that it will not tarnish, so there is no need to use a dulling sealant over the top – it will retain its shine and lustre for many years, while protecting the wood underneath from the elements,” adds Mr Howard. The dome is Castle Howard’s defining architectural element. The enormous lead-lined cupola rises up from the stone drum which is surrounded by a ring of gigantic busts. The apex to the building is the small wooden lantern above the cupola, which in turn has its own little cap topped by a large carved finial. The lantern and finial together stand five metres high. The last time the dome was covered in gold leaf was in 1997, and before that in 1961 when the dome has been rebuilt after the fire of 1940. Subject to favourable weather conditions, the scaffolding should be removed in mid-to-late September, when the golden crown on the majestic building will be revealed once again.